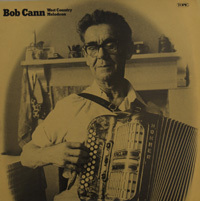 Bob Cann is an exceptional melodeon player from the south edge of Dartmoor in Devon. As a young man he played for hours-long step-dancing competitions; in middle-age he won an all-England folk instrumentalist trophy (beating the renowned piper Billy Pigg) from the English Folk Dance and Song Society. His repertoire is typical of the finest country dance musician but his playing is of the highest order – exciting and eminently danceable.